Carrying a gay child, Jesus walks on dangerous waters above the shark-like jaws of a clergy hat in a new cartoon by Mr. Fish. 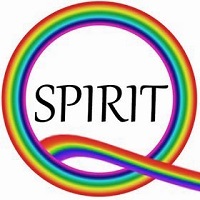 The cartoon shows Jesus carrying a gay child, signified by the rainbow flag on the child’s shirt. 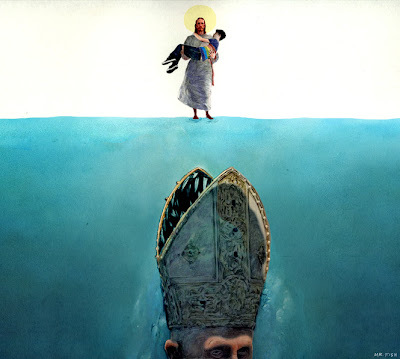 Lurking in the water below them is a gigantic mitre -- the tall, pointy cap worn by Popes, bishops and other clergy. The hat has two shield-shaped halves that open like the toothy jaws of a shark. Will Jesus save the child, or will they both be swallowed up by the holy terror of anti-LGBT religious oppression? Booth is a cartoonist and freelance writer whose work can be seen most regularly on Harpers.org and Truthdig.com. Over the last 20 years his work has been published by many of the nation’s most prestigious magazines and newspapers, including The Los Angeles Times, The Village Voice and the Advocate. A debut volume of his collected cartoons titled Go Fish: How to Win Contempt and Influence People was published in 2011. Special thanks to Mr. Fish for permission to share his cartoon here at Jesus in Love. And thanks to Paul Hartman for alerting me to this powerful cartoon. It's a remarkable piece of art and it's by someone I have never heard of so thank you for posting it. Art can say so much in so little, truly a stunning piece. I also hadn’t heard of the artist known as “Mr. Fish” until I saw this cartoon. This happens to be 2nd time this month that I found and posted a new cartoon by a mainstream artist on the subject of Jesus siding with LGBT people. Our issue is heating up and going mainstream! Good to hear from you, Spook. Sage! I was just talking to my partner Audrey this week about how I missed hearing from you now that you’re more involved in the Occupy Movement. I’m glad that you’re still enjoying this blog! Wow, what I fantastic piece of art!